There is a script from "Can I Do You Now, Sir?" in the collection. 7 July, 1945 - Lancashire Evening Post. 11 August, 1945 - Sunderland Daily Echo and Shipping Gazette. 14 December, 1945 - Birmingham Evening Post. Taken from The Sunderland Daily Echo and Shipping Gazette of 2 August, 1945. 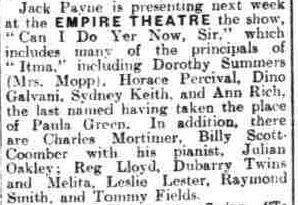 The Lancashire Evening Post of 7 July, 1945, makes mention of a performance at the New Opera House, Blackpool. 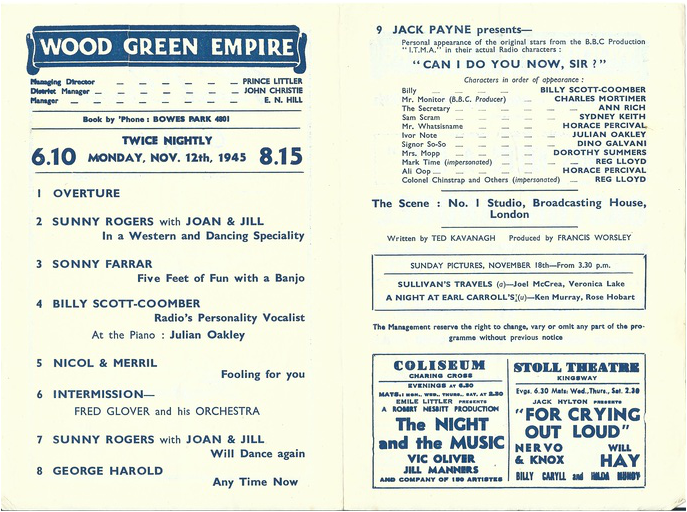 The Stage - 4 October, 1945. Golders Green. 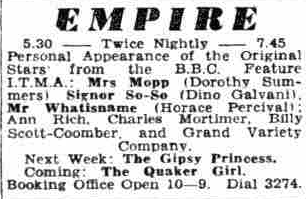 "The second half of the bill is given up to "Can I Do You Now, Sir", in which several stars of "ITMA" fame make their appearance in their original radio characters...........Charles Mortimer ably fills the role of a BBC producer." Western Morning News - 16 October, 1945. Palace Theatre, Plymouth. ".....Charles Mortimer as the studio producer." From the Sunderland Echo and Shipping Gazette of 10 August, 1945. From the Nottingham Evening Post, 21 July, 1945. From the Lancashire Daily Post on 5 November, 1945. From the Yorkshire Post of 31 July, 1945. Principals from " Itma " are in the variety show this week. Dorothy Summers, Ann Rich. Sidney Keith, Horace Percival and Dino Galvani take part in the hilarious scenes. " Can Do You Now. Sir?" and have the assistance of Billy Scott-Coombcr, Julian Oakley and Reg Lloyd, who also appear in individual turns, and Charles Mortimer. 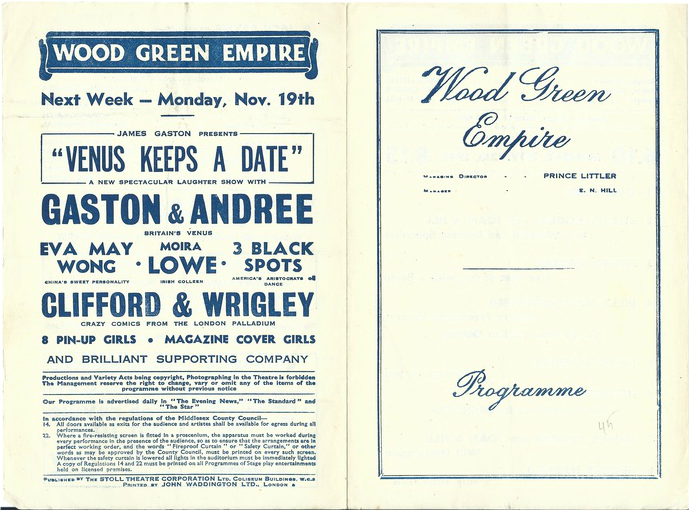 The audience also enjoyed the entertainment provided by Billy Russell, Tommy Burke and Co in versatile aerobatics, the Dubarry Twins and Melita in dancing numbers, and Reg Lloyd, impressionist. 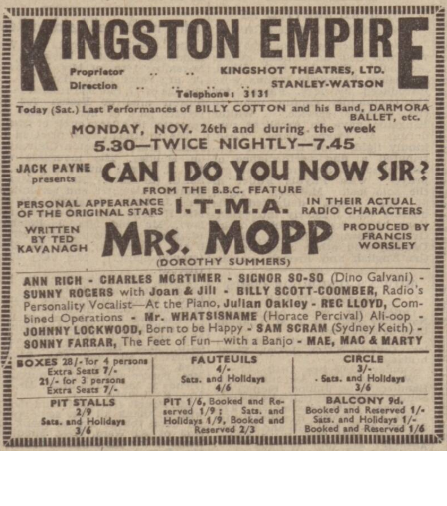 From The Middlesex Chronicle of 24 November, 1945. 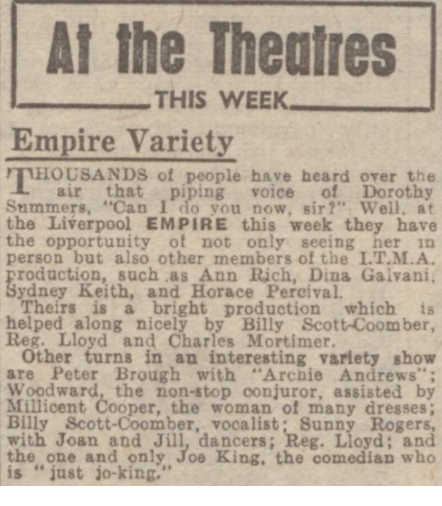 From the Liverpool Evening Express of 28 August, 1945.